1483369293 -Revised to reflect the current status of scientific and professional theory, practices, and debate across all facets of ethical decision making, this latest edition of Celia B. Fisher’s acclaimed Decoding the Ethics Code: A Practical Guide for Psychologists demystifies the American Psychological Association’s (APA) Ethical Principles of Psychologists and Code of Conduct. The Fourth Edition explains and puts into practical perspective the format, choice of wording, aspirational principles, and enforceability of the code. 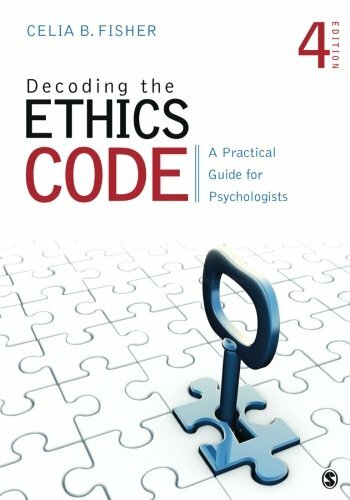 Providing in-depth discussions of the foundation and application of each ethical standard to the broad spectrum of scientific, teaching, and professional roles of psychologists, this unique guide helps practitioners effectively use ethical principles and standards to morally conduct their work activities, avoid ethical violations, and, most importantly, preserve and protect the fundamental rights and welfare of those whom they serve.